With Kamen Rider Gaim returning to its regular scheduled program with episode 5 entitled: Return! The Ichigo Arms of Friendship "Fukkatsu! Yūjō no Ichigo Āmuzu!" 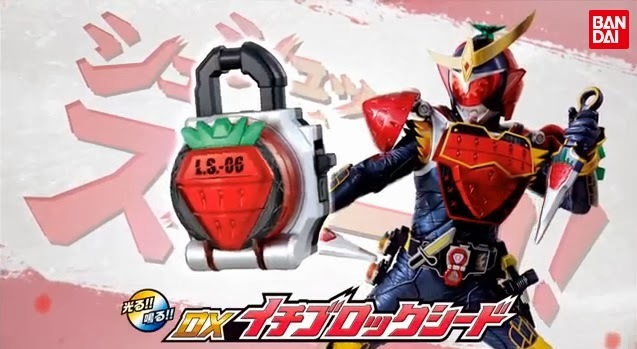 (復活！友情のイチゴアームズ！), Bandai has uploaded its latest toy commercial of the DX Sengoku Driver featuring the DX Strawberry Lockseed. 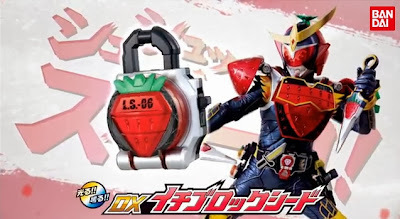 Sold as a separate item, the latest offering still works like other DX Lockseeds with activated sounds such as Soiya! Ichigo Arms! Shushutto Spark! This was released last November 9 for 1,575 yen. Donations fund my reviews. They are appreciated but not expected. All images used for Toy Review articles is 100% owned by the author/blogger unless stated otherwise. The blogger is happy to share these however deserves to right to demand to pull out from other sites aside from this blog if it is misused for criminal and unjust causes.